What do you want to see me draw more of? What brought you to following my gallery? Any particular favorite pieces? Well, as others have said, your beefy guys are always great ~ but I also miss seeing more of your monsters and dragons! It's cool seeing all of the different designs you come up with! I started following you when we met back on Neopets, so at that time it was mostly Zafaras everywhere, haha! As for favorites, I will always have a soft spot for this picture of Nar and Bu on Halloween! 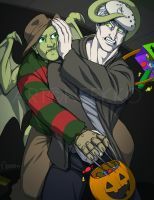 Freddy VS Jason is love! While I enjoy the beefs, it's definitely something that I'm not as interested in drawing much anymore. YES on the monsters & dragons!!! I miss working with my original stories too and want to focus more on them. Gun Show, Workout, Bringing Out the Big Guns...those are all great. After spending 10 years living in PA, we felt it was time to move on, so we're relocating to the west coast this week. Movers are coming for our stuff tomorrow and we're gonna arrive in Seattle on Thursday evening. I can't say that I won't miss being on this side of the country, but at the same time we felt that where we currently live is very isolated & limiting and it was wearing us out mentally, so we're hoping that a fresh start in new city does us good! I can't wait! Musubi Cat on KickstarterI know most of you follow me for beefy dudes, but I also design cute toys & merch as a side job and I currently have an ongoing Kickstarter if you're interested! This is a very rare opportunity at a chance of getting art from me, as I almost never open for commissions or requests. Just follow the rules in the attached image to enter. You don't need to be following me on Twitter to participate, though if you're following me here for my art, you should probably follow me there too since I post more there these days! Holiday Card 2017 - LAST CALL!I'm leaving the signup form open until I finish drawing the card. It's slower than I anticipated, but it'll probably be done tonight, then I will close signups for the year (around Dec 11 @ 11:59pm). If you haven't signed up yet and you are interested in receiving a card (it's free and open to anyone following Bu or I), please visit the Google Form below! If you have already signed up and selected "yes" to sending us a card back, but have not yet received our address, send me an email at hey@neekko.com or leave me a Note here! Also, please whitelist my email (hey@neekko.com) if you have a strict spam filter!!! Follow me!Just the annual social media boost, lol. I seemed to have lost a huge follower base as people distanced themselves from dA years back, so I really appreciate it if you could continue enjoying my art on these other platforms! I know you guys follow me for buff guys, but I also design & create kawaii stuff (more than buff guys lately >_>). Please spread the word!!! My side crafting business, Pocket Sushi, is branching out into more printed/manufactured designs (because my fingers hurt) and enamel pins are expensive to produce. Interest CheckWhat do you want to see me draw more of? What brought you to following my gallery? Any particular favorite pieces?